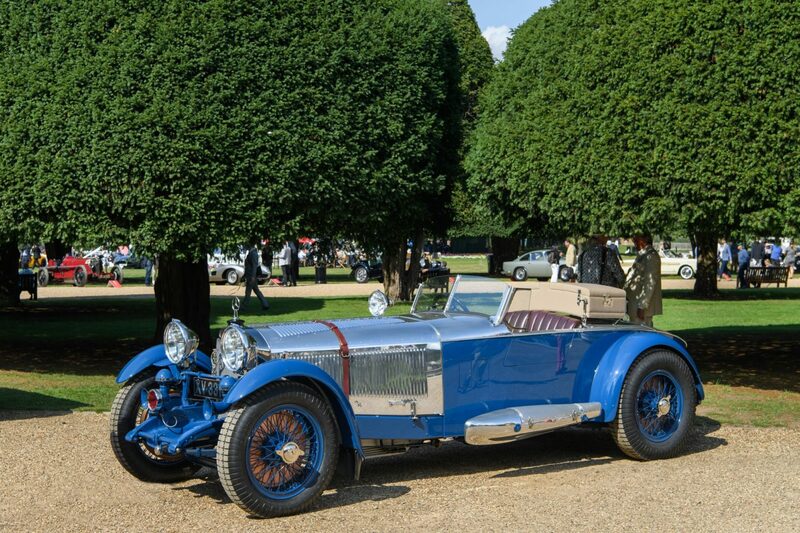 The Concours of Elegance is celebrating another weekend of motoring royalty, welcoming well over 10,000 motoring enthusiasts and around 1000 incredible cars into the spectacular gardens of Hampton Court Palace. Best in Show was awarded to the Mercedes-Benz S-Type Barker ‘Boat Tail’, as voted for by the owners of the Main Concours cars. More than sixty of the world’s rarest cars were parked in the spectacular Fountain Gardens of Hampton Court Palace vying for the honour of Best in Show, and the incredible Pullman Trophy. The quality of the cars this year was so impressive that to even be invited to attend was a triumph. Among them was the Porsche 917K driven by Steve McQueen during filming for Le Mans and the last four-cylinder Ferrari built; the 500 TRC. The Best in Show-winning Mercedes-Benz S-Type Barker ‘Boat Tail’ is based on the 1927 Mercedes S-Type; one of the most powerful road-going automobiles in the world in period, developed as the perfect road-going, race capable car. The Royal Automobile Club also presented Katie Forrest with the Spirit of Motoring Award for her passion and flair in taking part in the Concours in her 1912 Rolls-Royce Silver Ghost ‘Taj Mahal’, affectionately nicknamed ‘Nellie’. Outside of the main Concours of Elegance cars, nearly 1000 other models parked at Hampton Court Palace for the weekend, including a collection of Future Classics which crowned by the car that eventually won this class; the one-off Rolls-Royce Sweptail. Also taking part in the feature were the one-of-seven Aston Martin V12 Vantage V600 and McLaren Senna #001. Meanwhile, the Harry’s Garage display brought together the world’s fastest supersaloons, including the Ferrari-engined Lancia Thema 8.32, Jaguar XE SV PROJECT 8 and Aston Martin Rapide AMR. Also on display were some of the finest examples from the UK’s most prestigious car clubs, as part of the RAC Club Trophy. A panel of expert judges, including HRH Prince Michael of Kent, deemed an Alvis Speed 25 Drophead Coupe to be the best on display. The Speed 25 is acknowledged as possibly the finest pre-war Alvis, with this Drophead Coupe example delivered to coachbuilders, Hooper, incomplete with unfitted panels supplied by Charlesworth. Although the shape is therefore unmistakably Charlesworth the interior and many fittings are unique. Nearly 80 historic Jaguars were on display on Saturday, competing for the Jaguar Trophy. Led by Jaguar guru, Phillip Porter, a panel of judges overwhelmingly decided the car they would most want to take home, was an impeccable and highly original X120. The very early steel car has only covered 53,000 miles since new. On Sunday more than 60 Bentleys arrived in the gardens, ranging from the pre-war grand prix cars to some of Bentley’s very latest Continental models. A judging team of Bentley experts carefully assessed each and every model on display before deciding that the pre-1965 Bentley Trophy be awarded to a stunning S2 Saloon. The post-1965 Trophy went to a 2000 Continental T.
Bridge of Weir Leather Company’s ‘British Legends’ Award had a shortlist of nominees from automotive industry famous faces, who each picked their favourite British motoring icon. Following a public vote conducted over the course of the event, the British Legends Award was handed over by Bridge of Weir MD, Karen Marshall, to a Morgan 4/4. As ever with the Concours of Elegance, a huge amount of money was raised for the event’s chosen charities this year; Springfield Youth Club Hackney and the College of St. George. This year’s charity auction was sponsored by Ferrari Financial Services.